The reason it's so rare that others understand our pain is easy to explain. Few people in this world had relationships like ours. We found that perfect for us person that made every moment of our life feel "right". We had unending love and real joy. And then, abruptly, we lost everything. It feels like we're nothing but an empty shell and our heart's been shattered into a million pieces. Things we used to love have little interest to us. The world and the people in it, seem different somehow. They seem oblivious to our pain and our loss. We've fallen into a bit of quicksand and we don't know how to pull ourselves out. We're stuck in a place that hurts so bad that, at times, it's a challenge to even roll out of bed. That's how it is in the early stages of grieving our beloved soul mate. There's no magic wand to wave and no definitive tutorial. It's just a one step, one moment, and one day at a time kind of life. Coming here and posting like you have is a big step and it will help. We all need each other. Sorry for letting so much of my pain show. Guess I just need to get it out sometimes. I am really grateful for the life I've had. The pain has to go somewhere. This is probably one of the best and safest places for it. Mitch describes it much better than I can. In this respect I see that I am not alone. We all do need each other. I recently posted this, but thought of it again today as I read your post here. 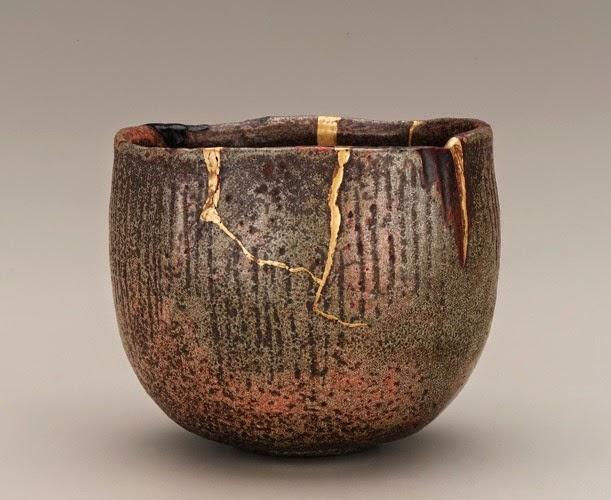 Kintsukuroi means ‘to repair with gold’ in Japanese, and is the art of repairing pottery with gold and understanding that the piece is the more beautiful for having been broken. Guess I just need to get it out sometimes. This forum is honestly a fantastic resource. We can openly talk about our feelings and pain here without judgement and with real understanding and empathy. If you were to vent about your pain in real life, all you'd get would be "understanding" nods, and a bunch of "I'm so sorry's". It's not that people don't care, they just don't know what to say. Even those insensitive people who tell you it's time to move on think they're helping. Marty's forum is an oasis in the cold, dark, dismal world of grief we live in. It's our own little grief safe house. When I first met my wife, I was very surprised when she told me she had never slow danced together, arm in arm, cheek to cheek. Our favorite song was Journey's ....forever yours, faithfully. So, I put on our song, grabbed her in my arms, and we began to slow dance together as I sang the words to her looking all the while into her beautiful hazel eyes. When the song finished, she had the biggest smile on her face. For weeks afterwards, every evening when we were together I would ask "what would you like to do"? She would smile and say, "slow dance". It seems to be getting more and more difficult to talk to my family about the loss of my beloved wife Rene'e. They were all present at our wedding and I know they loved her as well. I think that it is definitely true that they feel the pain with me and that it is hard for them too. They remember that when we were together I was the happiest I've ever been. And now, I know they see only my pain from such an overwhelming unexpected loss. 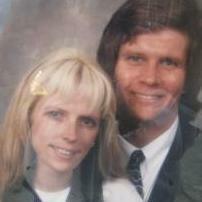 I was alone for a very long time before I found my wife Rene'e. She used to send me text at work saying "I am wanting to be with my husband right now". She was so very special to me. It is hard for me to imagine that I could find someone like her in this world, she was my dream come true. My family loves me and they do not want to see me hurting. In this respect, I know it is hard for them too. Your memory of dancing with Rene'e is beautiful and special. It is memories like those that help us find our way. Yes it is. In the beginning the memories brought pain, now they sustain me and I smile as I think of the love we shared. It has to be enough to last me a lifetime, it's all I have. It has to be enough to last me a lifetime, it's all I have. This reduces me to tears. (Not your fault, Kay). I’ve been struggling with many losses lately that his is magnified. If ever I need him it is right now. His is showing me how alone I truly am. I have been reduced to tears once again. It's getting close to the one year anniversary of my first date with my dear wife Rene'e. Our first date was May 23rd, 2018. I was actually dreading the end of winter just because we first met in the spring. This spring I would be without her. It is so crazy how much even the things I do not like so much I really didn't mind doing once I knew I had someone in my life who truly loved me. Every act takes on a whole different meaning. When I lived alone, I would do work around the house out of having nothing else better to do and wanting to get things done. When I was with a Rene'e I would mow the lawn, walk the dogs , wash the cars, paint the house, wash the dishes, take out the trash, go get groceries, and prepare dinner, with ease and a light heart and a big smile on my face the whole time because I knew life was good and at the end of the day I would be spending my time with the one person I loved more than anything in the world. My wife. I gladly faced all of life's daily challenges because I no longer had to be alone. We had each other, and together we were going to be just fine. And just when I had everything figured out, everything changed. Now I am alone again and it's so hard. I miss the pure joy of loving and being loved and having somebody. Rene'e put pictures on my refrigerator of her and I and when I looked at them today all I could think of was that I would never get to see her again; never get to hold her again; never get to tell her I love her again. And when I have to do all the things I have to do without her, knowing what it felt like when we had each other, everything seems a thousand times more difficult, and the little losses are very much magnified and the little pains hurt so very much more than I ever imagined they could. I asked her to marry me on June 23rd, just on month after our first date. I had never wanted to be with anyone the way I wanted to be with her. I remember how happy I was when she said "yes". She told me her mother said that I was "a keeper". I am lost this spring without her. I hardly even know it's here. The tears just keep coming. I don't know what I am going to do this June 23rd. I don't even like thinking about it, but I know it's coming. And, I realize the cold hard truth that I have nothing figured out anymore without my beloved Rene'e. I’m glad to see you are still with us, tho I also wish you didn’t have to be. You described so many things we all did in our daily lives that were part of 'normal' living and now like carrying a bag of bricks on your back as you do them. No more sitting down in the evening and having that fulfillment of an active day shared and now some well deserved together time. We all know of what you speak and feel. I accomplish things he once did as well as my own, but I don’t take any pleasure in it. I actually hate doing his stuff because I don’t like yard, technical or repair things. He loved it, the challenge. I was perfectly content doing the house, taking care of the dogs needs and shopping for our dinners. I don’t know how to be single anymore tho I’m doing it. It feels alien. It’s been over 30 years that I was on my own and there was no house, computers, machines more complicated than maybe a washer. I went blind to seeing his face in the pictures around the house for a very long time. My mind protecting itself. Now I see him in them and wonder, was it even real? But the tears and memories confirm it. Then there is the skin hunger. Touch says so much and is crucial to our mental survival. That’s a tough one. Keep writing what you feel. A least you will be validated and understood here. Outsiders only think they get. They do not. I had time knowing this was coming and still I was not prepared for the reality. We cant give you Rene'e back, but we can be here for you as you walk this journey. I don't know how you will face June 23rd...probably much like my first Oct. 19th without him...it was the happiest day of my life when we married and I did not know how to handle it after he died. It still represents that happiest day to me only it comes now with pain, the pain of missing him, the pain of that hole in my heart. Gwen your response touches me, it reminds me how for some time I put his pictures up, took them down, up, down, depending on how it affected me, finally they were up to stay. In the beginning it filled me with pain, but now I look at his face with the comfort of knowing he was the only man who ever loved me, and at least I had that once. And no one can take that away from me. No death can alter that. It is mine still. But God how I miss having him here with me to hold and look into his beautiful blue eyes and here his voice that lulled me! His eyes were blue but depending on what he wore once in a while looked green, they were beautiful, his grandkids got his eyes and they were the only thing of his able to donate. I'm amazed how young he looks in the portrait up on the wall but then he was in his 40s, I'm 66 now so of course have aged. I know he still would have loved me the way I am, aging and all. My wife had very beautiful hazel eyes. I really loved looking at them. It's one of the many things that attracted me to her. I had a dream last night that I was driving my old white truck with her by my side and she was jokingly giving me a hard time about it cause we had just bought a pretty 2016 red truck which I had chose to leave at home. I couldn't see her although I could feel her. When I remembered the dream when I woke up I felt comforted for a moment then I just broke down into tears. Since we brought the red truck together just two weeks before she passed I have a difficult time driving it. I can still remember how happy we were when we drove it home from the dealership together as she listened to her favorite song and the huge smile she had on her face as she sang the words to me and looked into my face lovingly. I wish we could just all go back to the wonderfully happy lives we all had. It does really help to have all of you to talk to and understand so completely how difficult it is to try to find a way to continue on. Johnny: Sorry to see that you have had to join this club. But, you will find solace by writing and reading comments on this forum. I just had to face an anniversary on April 8th - I lost the love of my life on April 8, 2015 after being married almost 51 years. He drove a 1999 diesel truck and now each time I hear a diesel truck my heart stops. It is good that you can dream of Rene'e. I can't seem to dream of my husband as much as I would like to. When I do dream, if I don't write down the dream as soon as I wake, I will forget. I agree, it is comforting to dream of them. Even after four years, I still say what you say: "I wish I could just go back to the life I once had". But, I am so Happy I did have those years with my blue eyed man - and I was always amazed how his eyes twinkled when he teased me, always making me smile. Like so many have said, "Take One Day at a Time". I am truly only able to take one day at a time. I spent the greatest part of my life alone and was so overwhelmingly in love with my wife that she very quickly became my whole world. Everything I did was for her. I only wanted to make her happy and would go to any length to see her smile. I am so very grateful to have had her in my life. I still sometimes can not believe that I was fortunate enough to have found someone so loving and caring as she was. I often told her that her heart was the biggest I've ever known. She had so much love and compassion. I think that is what hurts the most. When you have finally found the one you have spent your whole life searching for, and suddenly and unexpectedly they are taken away. Like you, I miss her teasing me. She used to pick at me when I ate Avocados, she said they looked like "baby pooh". We did not even meet until our 40s but we became each other's world also. I never in my wildest dreams thought he'd die so young. I thought we'd grow old together, holding hands on our porch swing, watching the hummingbirds come to eat. I understand about never wanting to think that we might lose the one we loved more than anything. Just the mere thought of something like that happening is so terrible we never want to imagine that it could happen at all. I went to Sunday service this morning. I have a very hard time going because I've never made it through a single service without breaking down in tears. Rene'e and I were married in the Chapel and my friend at Church was my best man at our wedding. He called me and told me that he missed seeing me on Sundays. It's been awhile since I've gone and I told him I would be there. Every time I go, I can't help but remember how good it felt when she was there to put her arm around me as we sat together side by side. It always hurt my heart a little to attend church and see all of the other happy couples around me before I met Rene'e when I used to attend service all alone. How proud I felt to have her by my side. I've never felt as happy as when she was there with me in Church. She was always so beautiful to me. This time I made it all the way till the end of service before breaking down in tears as I left. There will be a time when you can do the smallest of things without the big breakdown. And there will be times when the breakdown comes out of the blue over nothing. These are all part of the process. Painful as they are (even for me), allow yourself to walk through them. At first I tried to take a deep breath and put it aside. Now I go outdoors, lift my head, go through the tears, and thank Spirit and Stephen for being with me at that moment. Yesterday I was able to view some small videos I am blessed to have of Stephen. Most of him with our pup Louie. One of him showing and giving instructions how to start the small generator (which I needed to do today just to run it). The videos made me laugh and smile without being teary. Funny, she was holding her white wedding bouquet in her right hand with her arm around my shoulders. Looks like I have snow white hair.